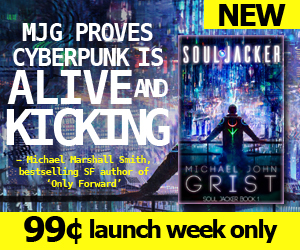 Soul Jacker review from Michael Marshall Smith! This is immense news for my author career, as well as being an amazing personal accomplishment that I probably was distantly dreaming of 20-odd years back, when actually writing and publishing novels seemed very far away. I gulped down Michael Marshall Smith’s novels back then: Only Forward, Spares and One of Us. I loved them. Re-reading them recently, I’ve come to realize how much his work has influenced my own writing. Soul Jacker definitely owes a debt to Only Forward. There are certainly similarities – in tone at times, in world, in the concept of hacking into a mind/dreams. So I was amazed when Michael Marshall Smith replied with interest after I reached out to him about Soul Jacker. He didn’t usually read and give blurbs, he said, but my book description grabbed his attention so he would give it a go. I sent the book a month back and waited with bated breath. 2 weeks passed and I reached out – he said he was 20% through and enjoying it. 2 more weeks passed and I reached out again – no response. 3 days went by and I thought I’d blown it – then he came back with a quote! This is awesome. It’s on my amazon page already. I’m making ads to incorporate it. It’s kind of a dream come true – and all for this book which, as Mr. Ruin, went nowhere, sold no copies and has only lost me money hand over fist in new edits, covers and failed marketing bids. Only 3 days ’til launch! I’m excited to start running the ads. For the first time ever I’ve got some real, authoritative social proof, and it feels great.